Good Morning!! I have not been sucked into a huge black hole and spirited away to some distant planet. I’m right here and still chugging along. I’ve missed everyone. I knew I was in trouble AND a slacker when my best friend Gail called from Florida to catch up and said that she didn’t know what I was up to because “someone had not been writing her Blog! !” I guess she told me. Here I am, alive and well. I’ve actually been recovering from the Holidays and working at improving my mood. I’m feeling better and working to rev up my enthusiasm for the tasks before me. I won’t bombard you with everything at once. I’ll ease back in. The major thing I want to talk about today is something that I find quite exciting. 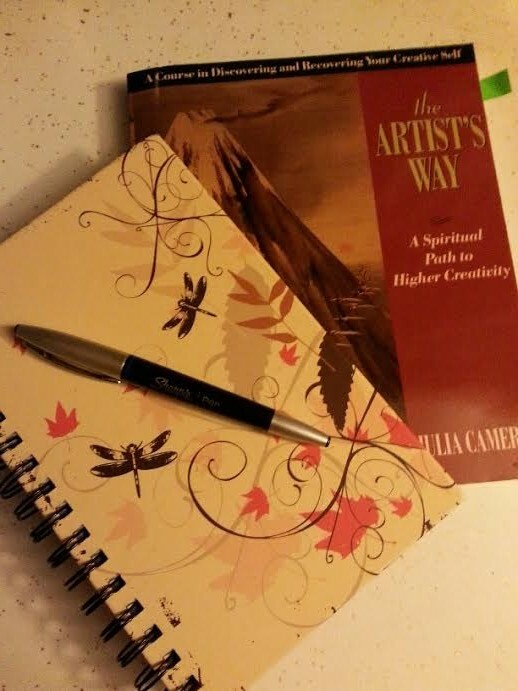 Through Meetup, I’ve found a group that is working through Julia Cameron’s The Artist’s Way. At least five times in the past, I’ve tried to go through this program on my own. I have always been unsuccessful in the past. I couldn’t make myself read through the program, write the morning pages or complete the tasks. I guess I need to be in what I feel is a structured or more class-like environment in order to do it. I joined last week and attended the first meeting on Wednesday. It was fascinating and a great learning experience. The group is small so far, only five people including Monica, our leader. I like the idea of a small group. Fewer distractions that way and we can get to know each other better. I feel that this time I am going to be able to complete it. In a way, I think this will help me focus. I know, I know. I’m always talking about focus and how I don’t have it and I am seeking it. That’s all true and as I go through The Artist’s Way, I think I will start to develop that focus. I’m not expecting it to happen overnight, but I think it will happen. I already feel that I’m developing a more positive attitude. That’s a very important step in the right direction. This is a twelve week course and I will try not to bore anyone by talking about it too much. However, after only one meeting, I feel that this will be a good thing. I will try not be so much of a ghost. I’ll be here doing my job. I hope you all miss me when I’m not here. I know that I miss all of you. This entry was posted in Uncategorized and tagged books, The Artist's Way. Bookmark the permalink. sure be a easy for you–the key is the morning pages. do you have her other books? I’m enjoying the morning pages so far, Bob. I’m going to give it a good try anyway. I have several of her other books. I read her memoir which was also interesting. Have a great weekend! i read about the artist’s way so long ago!! i love the idea of the morning pages. oh man. good for you trying to work through the whole thing; i didn’t know it was 12 whole weeks. Yup, 12 weeks. We’ll see how it goes! I’ll save you a seat this moring! Glad to see you alive and kicking. If you didn’t turn up on my Instagram feed, I would have started to wonder. You’ll have to tell Gail to get an IG account. I think I have this book somewhere in my shelves. I think it was a gift from my mother one year; it sounds like something I should pull out and maybe put to use. Nice to see you again Fran. I’m really enjoying the Artist’s Way so far, Meghan. Lots of good ideas. I didn’t think I’d like the morning pages but I do. Sorry I didn’t get to link up yesterday, my computer was acting crazy. I’m going to post today and link up anyway. Thanks for noticing I wasn’t around! I’ll try to do better! Thanks, Monica. The Artist’s Way is becoming a very natural and important part of my life. Amazing! Glad you found my blog and I will be writing more. I’ve been in this slump and I will be getting out of it! Looking forward to Wednesday evening. Have a great day!